I May Not Have Psoriasis? A few months ago I went to a new dermatologist. I decided to try something new and go for a female doctor. My hope was she could relate to me more and perhaps work harder to rid my skin of flakey achy psoriasis. The doctor visit started off as a normal one. I signed myself in, answered the new patient questions, past history… You know the routine. Everything was fine until the doctor came in to survey my skin. She asked a few questions about the history of my condition and continue to gaze, her face a bit perplexed. After the awkward silence, she then told me that I had a very interesting looking case of psoriasis. Due to the coverage, tones, and appearance it looked as if it could be something else. At this point I had a blank stare on my face. She continued to go on to say it could be Lichen planus. She said, “Have you ever had a biopsy of your skin?” I dug deep for the memory of when I was first diagnosed with psoriasis. From what I remember, the doctor didn’t want to do a biopsy because, to him, I was too young. I remember as I grew up my grandmother complaining about the doctors not giving me a biopsy to see if it was truly psoriasis. 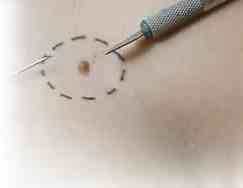 With fear and hesitation, I told the doctor from what I could recall I had never had a biopsy done. She then numbed my skin, took a small chunk, gave me information on Lichen Planus, sent my skin off to the lab for testing, and told me to call back in a week for my results. Ugghhhh! At this point I was so frustrated, and to have to wait a whole week for results that could ultimately change my life. The thoughts that fled my mind were over whelming. I first thought, wow another disease I can’t pronounce or spell, I have just gotten the hang of saying and spelling pso-ri-a-sis. Then after researching the new disease the only clear definition I could get was “Lichen planus (LP) is a disease of the skin and/or mucous membranes that resembles lichen. It is thought to be the result of an autoimmune process with an unknown initial trigger. Where the trigger is known, the term lichenoid lesion is used instead. There is no cure, but many medications and procedures have been used to control the symptoms (Wikipedia),” which didn’t help much. From what I could see, this new disease was less known than psoriasis. And then to top it all off, how was I going to tell the wonderful team at the National Psoriasis Foundation that for almost 20 years I have passed as a fraud claiming to struggle from “psoriasis.” I had even joked with my husband saying that I loved the NPF so much ,that if my test results came back that it wasn’t psoriasis I wouldn’t tell anybody. I just wanted to scream! I was fascinated by this story. A similar thing happened to me before I was diagnosed. The specialist – a neurologist – actually said he thought I had MS and sent me for all the tests. It was not MS! I was relieved but also angry at the doctor for saying that he thought it maybe. Wow, I wonder why he thought it was MS? I would think the symptoms are totally different.